The common stinkhorn is fungus that you’ll almost certainly smell before you see. Its common name is derived from the rather obnoxious odor emitted by the phallic-shaped fruiting body. 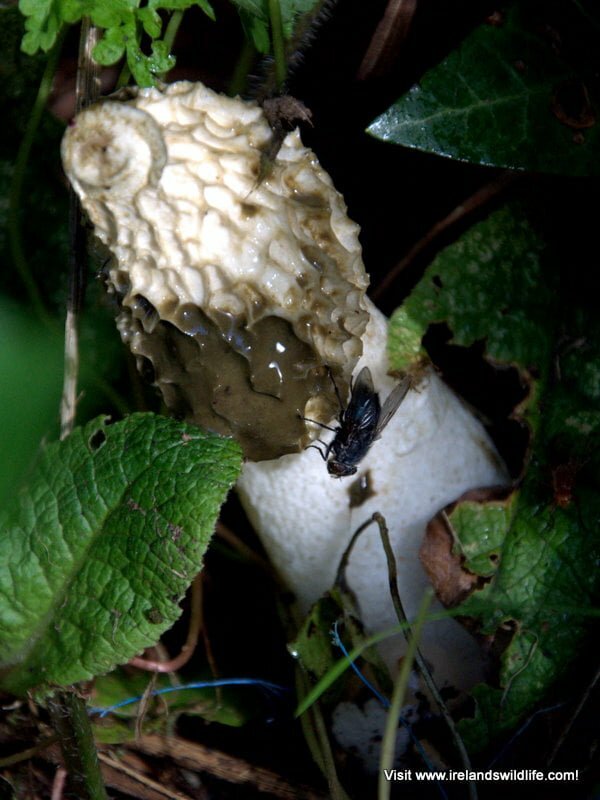 Unlike most other fungi, which rely on wind for spore dispersal, the stinkhorn’s spores hitch a ride with insects — specifically flies, which the mature mushroom attracts, sometimes in vast numbers, by mimicking the smell of rotting carrion. This widespread mushroom occurs in the leaf-litter of conifer and broadleaf woodland and parks, where it is generally associated with rotting wood. It also occurs in gardens, particularly in areas mulched with bark or wood chip. Like most fungi, the common stinkhorn spends most of its life unseen. The bulk of its mass is contained in a network of tiny thread-like hyphae that permeate the rotting leaf litter and wood from which the fungus obtains its nutrients. We only see the fungus above ground when the fruiting body emerges in summer and autumn, either singly or in clusters. Young fruiting bodies are white or yellowish in colour and are around 3-4 cm in diametre that resemble eggs. When the phallic-shaped mature fruiting body erupts from these “eggs” it does so very rapidly, reaching a its maximum height of between 10 and 25 cm over the space of only a few days — or even a few hours in the case of the fastest recorded cases. The tall stem is topped by a conical cap that is olive-green in colour at first — and it is this green, slimy coating to the cap that emits the foetid odour, attracting a host of flies which feed on the mucous-like layer. Some spores stick to their legs and feet, and they ingest others along with their meal before flying off to deposit them elsewhere. Before long the cap loses its green coloured coating — stripped bare by visiting flies — and the fruiting body breaks down quickly — disappearing almost as suddenly as it arrived. The young fruiting bodies of the stinkhorn are edible, and are regularly eaten in France and parts of Germany, where they are considered a delicacy. The sudden appearance of the egg shaped bodies out of the ground created some suspicion long ago, and led to their being dubbed “witch’s eggs” or “eggs of the Devil” by a wary populace. Over the years they have been used in love potions and aphrodisiacs (a trait no doubt prompted by the phallic appearance of the mature fruiting body), and were once widely used as a treatment for gout, epilepsy and rheumatism in Europe. This is a common fungus throughout Europe, and much of Asia. It is also common in North America west of the Mississippi, but becomes much more scarce in the east of the country, where it is replaced by the similar Ravenel’s Stinkhorn (Phallus ravenelii). It is also found in South Australia. Thanks for the comment Paddy — I remember reading something about that recently. Fascinating stuff — I may have to update the article accordingly :-). After finding the Stinkhorns in Glengarriff Woods,Cork I rather reluctantly prized the slimy outside off and ate the middle, this is in the ‘egg’ stage of growth. It smelled pleasantly of raw peanut and tasted of raw cabbage, a lot more palatable than I would have thought!